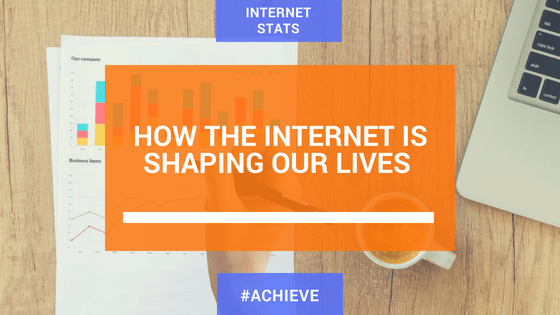 You will not need stats to convince you that the Internet is being used at an ever-increasing rate but you may well be surprised at just how much the Internet is shaping our lives. For most people, the Internet is an important part of everyday life, although there are concerns around some of the more negative aspects. One such example is less social interaction as children and adults are more likely to spend time on social media than to go out and spend time with actual people. Have you ever been in a restaurant and looked at the table next to you and the entire family are sat looking at their mobile phones? So the increased Internet use is not always seen as a good thing and the stats in this infographic will open your eyes up to just how much impact it is having. Did you know that over half of the world’s population are now Internet users? Considering how much of that population can be attributed to infants, the elderly and people in countries where poverty levels are high, this is quite a startling statistic. Social media has taken over many people’s lives, with so many hours now being spent on Facebook and other platforms each day. There are now 3.1 billion social media users worldwide, up 13% since last year. With new features being constantly introduced, people rarely get bored of social media and the upward trend is unlikely to change anytime in the near future. Another area that is interesting is the number of Internet users that are accessing via their mobile phones, which now stands at 52.2% of all website traffic worldwide. Web traffic from mobile phones has actually grown by 36% over the last 5 years so you can see how this is also on a steep upward trend. It will not surprise anybody that Internet usage is at an all-time high and that it has been growing ever since it was made available. However, did you know that over half of the world’s population now uses the Internet? (as per estimations in January 2018). People spend so much of their time on social media channels, catching up with friends, seeing what celebs have been up to or even locating businesses that they want to engage with. In 2018, it is measured that 90% of businesses are actively using social media. Facebook is the most commanding of all social media platforms, with over 2.2 billion and YouTube has passed the 1.5 billion mark. The stats in this infographic really do show you how much impact the Internet has on the vast majority of people in the world. With home technology being enhanced through voice recognition software like Alexa and Siri, and smartphones and laptops also benefitting from voice-activated personal assistants, voice search is becoming more frequently used. In 2018, it is estimated that over a billion voice search queries are made each month, which will have a huge influence on digital marketing strategies over the next few years. If you have a vested interest in websites or want to find out who the big players are in terms of website platforms, you will no doubt be interested to hear that WordPress now has 28% of the market share and over 15.5 billion page views every month. So if you are thinking of getting your own website set up, WordPress could be the solution for you, if you are looking for something popular and easy to use. It is also worth noting that over the last five years, website traffic accessed by mobile phones has increased by 36%!